The Bank Holiday weekend has allowed me to catch up on some much needed horror releases. First up, we have Saw 3D, the final chapter in the Saw franchise. The first film in the series I saw was Saw 2 and I have to be honest: the first five minutes were utterly gripping. I feared to carry on watching but damn it, I could not turn away. The rest of the film, sadly, lacked any of the tension or coherent plot. I made a point to check out the first one: which as a thriller and a concept was rather good. But I gave the intermediary sequels a miss based on how poor number 2 had been. Knowing Saw 3D to be the final one, I guessed the film’s producers would have pulled out the stops to go out with a bang and decided to test conventional wisdom. Grudgingly, I have to admit that all the traps laid out in the final film are utterly compelling (as well as repulsive). It’s almost as if the film’s producers have watched a Loony Tunes cartoon and decided to copy the traps into the real world. I preferred the fact that a film franchise which is fundamentally about torturing cardboard characters for 90 minutes had actually put some original thought into the very scenes that made it notorious. Films like Alien vs Predator, et al extensions to a franchise nearly always forget what made their originals popular. In this sense, Saw 3D stays true to its roots. That said, the acting is terrible and the plot makes no sense. Again, staying true to its roots. On the flip side we have Hammer’s return to the pitch with its new film Wakewood. Set in the UK, Wakewood tells the familiar be careful what you wish for plot with a pair of grieving parents wishing for the return of their child who was mauled a year ago with the help of witchcraft. The plot is nothing new: Godsend (2004) covered this ground with cloning at the heart of its story rather than mysticism. Don’t Look Now, The Monkey’s Paw are also forerunners. More recent pictures like The Door have reinvented fresh and exciting plots around the resurrection motif. So, the question becomes, what does Wakewood bring that’s new to the genre as well as a plot that’s been well-worn? The answer: not much. The film plods along for the first two thirds and then races to a bloody conclusion for the finale. That’s not to say the film does not have merit. The acting is superb. Timothy Spall as the village elder clearly relishes his part. He gets the balance between humour and strangeness just right. Aidan Gillen portrays a genuinely upset and hopeful father throughout the film that you feel what he’s going through. The challenge for Hammer in this age is one of relevance. With Wakewood it’s shown that it can make distinctly British films, but if it’s to move forward it must make an effort to reach a contemporary audience. The Channel 5 television show Urban Gothic came much closer to reinterpreting a modern version of Hammer in the late 2000s. The show was low budget—but the acting and execution of concepts were top notch. Saw 3D and Wakewood are available to buy from Amazon now. He who must be obeyed. I must remember not to blink so much–like an action man gone mental. You know it’s not going to be good, but you go anyway. A bit like making that once-a-year visit to some distant relative; you remember you maybe had a good time with them once a long time ago, but now you can’t remember exactly how you’re related. The first Scream arguably revived the horror genre in 1996. The first Scream wasn’t a great film but it was contemporary. It had a punchy opening scene, self-referencing dialogue and brought gore back to the mainstream. Coupled with a young upcoming cast and a ringer in the form of then it-girl Courtney Cox and horror maestro Wes Craven, it was the shot in the arm horror needed. Fast-forward 15 years and the landscape horror takes place in has changed. The Scary Movie comedy franchise pummelled Scream and related films until there was nothing left to poke fun at—this didn’t stop them from making more parody films though. The Saw and Final Destination films franchise upped the ante with elaborate death scenes. Japanese and Korean horror films brought back ghostly chills. A Serbian Film and The Human Centipede have pushed the boundaries in taste and decency. All this throws down a tough gauntlet for Scream 4 to live up to. The film (and indeed the plot) is essentially a remake of the first. It throws in mobile phones and web cams so that its teen cast are seen to be believable, but that’s the extent of characterisation. Rather than use this as an opportunity to rejuvenate the franchise with a new outlook or a new take the creative team simply reheat what they did in ‘96. It’s a bit like watching an older and fatter version of a pop star you once admired in their declining years—you question what you originally liked about them. While the review might sound like a downer, there is a positive, namely that the film to rejuvenate the horror/slasher genre in the 2010s has yet to be made. When it arrives, it will be something to look forward to. Review over at PopMatters by Andy Jones of The London Small Press Expo featuring a picture of me standing very, very upright. I don’t think I had an easel propping me up. Two days on from the Kapow Comic Con and I’ve been getting messages from readers who picked the London Horror Comic for the first time and who remarked that they didn’t know how good a small press title could be. Needless to say this made my day. Conscious of the fact that new readers might be poking around the site I thought I’d flag some links of interest. Firstly, you can download a free horror short called Web of Life here. You can also view the early works of the London Horror Comic from when we were an online web comic here. If you’d like to recommend to a friend that they also make a purchase of the London Horror Comic, we have an online store here complete with previews. You can also listen to a BBC Radio 4 documentary about horror comics where London Horror Comic was interviewed here (we chime in at 24:30). You can also add the London Horror Comic on Facebook here. Just finished the first day of the Kapow Comic Con 2011 and it went like a blast. What’s been good about the show has been the strong line-up of American and UK creators like John Romita Jr. Mark Millar et al. They’ve helped to draw a large footfall of traffic to the Business Design Centre in Islington where the convention is being held. The traffic in turn has helped deliver some much needed attention to some of the independent titles on offer. the diversity and range of work on offer. Day 2 kicks off tomorrow at 10:00 and finishes at 16:00, so if you’re in town do say hello. Just a short note to say that I’ll be at the KAPOW! COMIC CONVENTION this Saturday April 9 and Sunday April 10. Do pop along and say hi if you’re about. Take the Sherlock Holmes universe and twist it so that it takes place in a parallel dimension where World War 2 never happened (and with it, any scientific advancements). 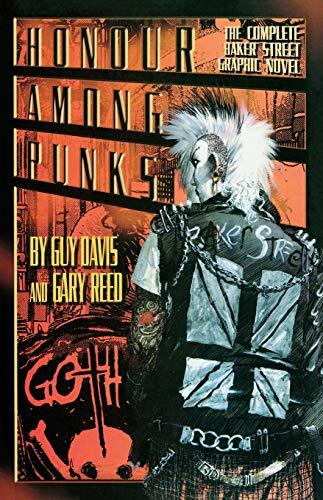 Replace Holmes and Watson with a pair of ladies steeped deep in a prevalent punk culture solving crimes and you’re left with the brilliant Baker Street series by Guy Davis and Gary Reed. I discovered the series by chance one Sunday afternoon in Hammersmith, in the dank back issue bins of a second-hand magazine-comic shop that was closing down. What struck me right away was the heavy black and white tones of the comic. The line work is angular and almost jagged in places, and yet the decoration applied to the fashion, the city and the characters themselves is highly detailed and done with love. It’s this combination of the ugly and the beautiful that makes the book speak to you before you even read a word: you understand the theme. As far as the writing goes, it’s perhaps one of the most emotionally adult depiction of human relations between two lovers. It charts the frailty of love, the ugliness of rejection and the consequences of how anyone, even with the keenest of eyes, can miss the obvious when it’s in front of them and they are truly in love. Plus, it’s a cracking mystery as the Holmes of this world takes on Jack the Ripper. Well worth checking out if you can find a copy.